As millennial hunters already know, if you’re in the market for hormone-free, antibiotic-free, organically fed meat, then there’s nothing more “clean” than game meat. As an ethical hunter you’re undoubtedly committed to using every scrap of that animal. Even if there are times when circumstances prevent you from being able to process your own meat, why not learn how to do it properly. Simply approach it as you would hunting. You wouldn’t hunt without proper equipment and sound mentoring or training, and the same applies to butchering. The chance to learn a new skill, to know stew meat from a pot roast, is deeply satisfying. The great thing is, all four-legged animals share essentially the same bone structure, and God gives you a meat-cutting map by how muscles are separated, explains professional butcher Gary Taylor. What this means is that once you learn how to dress, say, a deer, then you can apply the same principles to a rabbit or an elk. 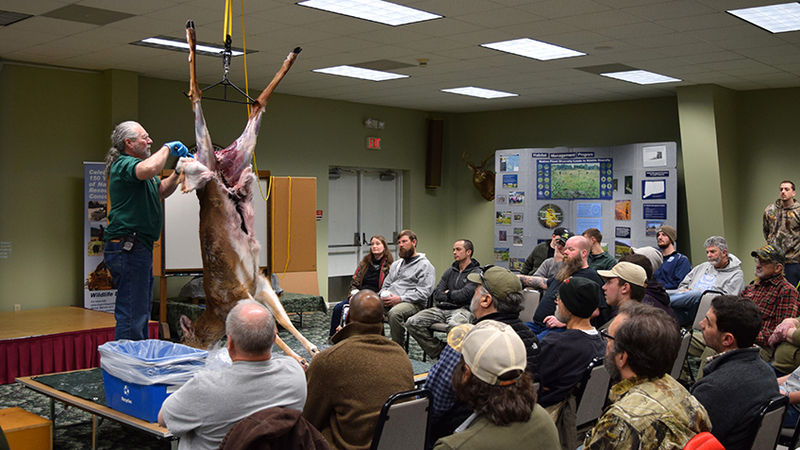 The Wildlife Division of the Connecticut Bureau of Natural Resources offers a soup-to-nuts selection of seminars for hunters and trappers through its Conservation Education and Firearms Safety (CE/FS) Program. In addition to classes on firearm hunting, bowhunting and trapping, there is a healthy selection of courses in Advanced Hunter Education. You can learn the specifics of hunting wild turkey, small game or waterfowl in Connecticut, as well as improve your marksmanship through a clinic. But one of the most popular seminars has been and continues to be the Venison Processing Workshop. 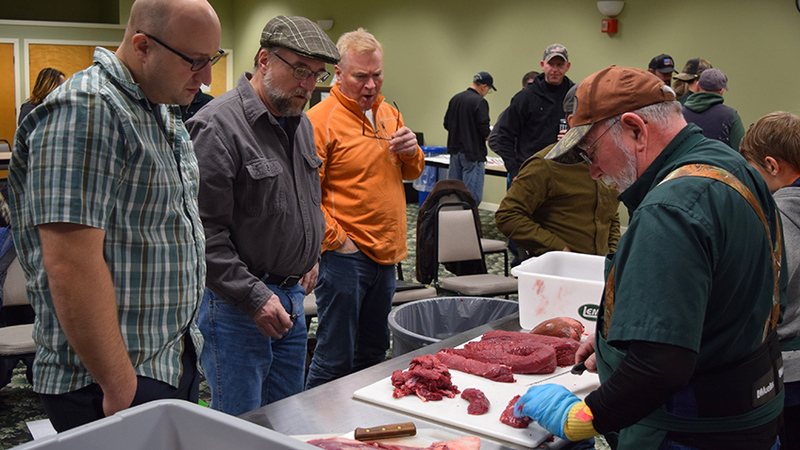 Professional butcher Gary Taylor talks to attendees at a Connecticut Conservation Education and Firearms Safety Venison (CE/FS) Processing Workshop while he does the meticulous work of skinning a deer. Tom Donlon is the director of the state’s hunter education, spearheading these programs—which are free, by the way—in order to encourage hunter participation. He is well versed in the R3 approach—recruit, retain, reactive—to building hunter numbers. The workshop began with a “wouldn’t it be cool” idea and each time the seminar has been adjusted to make it even more user friendly. For example, they wondered if those new to hunting might be intimidated by lifelong hunters who had processed a deer or more a year for decades, so they began offering morning sessions to experienced hunters and afternoon sessions to novices so that there wouldn’t be any pressure of an end-time. This allowed for increased participation by women and children and more questions. Then someone had the idea of strapping a GoPro video camera to Taylor’s head so that every move his hands made could be seen by everyone in the class. The camera was set up so that it projected onto a screen. At first Taylor would look at the audience as he was talking and taking questions. “I had to get used to looking at my hands,” Taylor admitted, laughing. This added feature makes it so attendees can see everything his hands are doing and every cut of the knife. The workshop also allows for hands-on participation. Connecticut CE/FS Venison Processing Workshop attendees get a close up view of various cuts of deer meat. The deer come from within areas of Connecticut that are managed by the state. As an aside, if you’ve ever been in an area where the browse line is not only devoid of vegetation, but of bark as well, and where the deer are stunted in growth and plagued with fur issues, you know the population has exceeded what the habitat can support. In Connecticut, where hunting is hampered by thick settlement that impinges on the legal discharge of a firearm, there can be hundreds of deer in an area that can only support, say, 25. Or, some area might not receive enough hunting pressure to keep the population in check. In such places, the state harvests deer and uses them for the workshop. A native of the Nutmeg State, Donlon served for 32 years in the U.S. Army National Guard full time, retiring as a sergeant major. His father and two brothers served in the Navy. The four Donlon men figured they reached a hundred years of combined military service. Donlon attended college at Southern Connecticut State University, majoring in political science. He first served as deputy director of the CE/FS Program, moving up when the director position opened. He is a lifelong hunter and is saddened that a generation of would-be hunters has been lost. He is 100 percent committed to the North American Model of Wildlife Conservation, adopted as official NRA policy in 2014, with hunters playing a big part in management based on sound scientific input from biologists. Taylor is also from Connecticut and a lifelong hunter. He knew college wasn’t for him, but he needed a job. His mother headed up a department in a grocery store, and more than one male member of his Sicilian family were butchers or owned a butcher shop. So it seemed meant to be when the grocery store owners asked him if he’d like to learn to cut meat. They invested in his training and he’s been a meat cutter ever since. 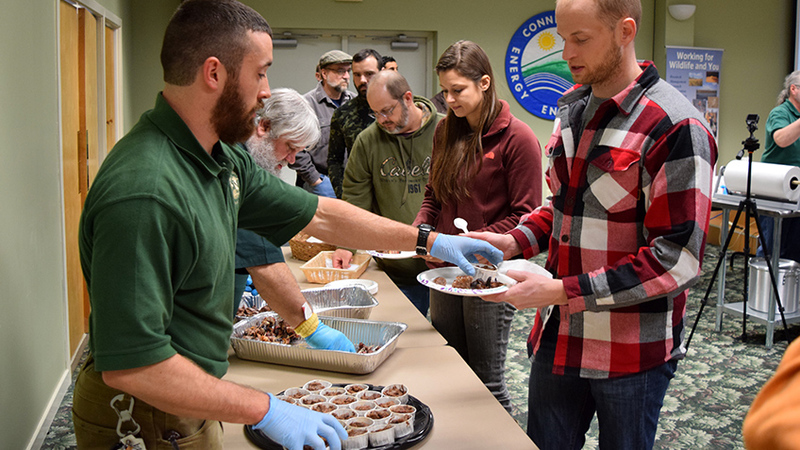 Of course, no Venison Processing Workshop would be complete without attendees being able to sample some cooked meats or soups. Taylor says there is no one way to process a deer, but he teaches in a manner that ensures hunters can utilize ever bit of the animal. Suggestions are offered on tanning the hide. You’ll be able to recognize an oven roast from a pot roast. He uses comparisons to everyday meats so you’ll know what a loin chop is and how to cut it. You’ll know what parts to use for making jerky and that those are not the same cuts you’ll want to reserve for your tender steak. Everything is provided for the attendees, including vinyl cut-resistant gloves for safety, and refreshment. Yes, you’ll sample some venison soup or perhaps some roasted pieces of meat. Taylor talks about knives, sharpening and what types of knives are best for each part of the process. “Hunting is not cheap,” Taylor emphasizes. When you consider the time and money invested in harvesting an animal, you don’t want any of that high-cost-per-pound meat to go to waste. These seminars fill up quickly. Donlon said he receives calls within minutes of notices being released. If you don’t get into one, keep trying. You will come away with an invaluable skill set, and with the GoPro capturing every move, there’s not a bad seat in the house. Saturday, Feb. 9 at 9:00 a.m.
Saturday, Feb. 16 at 9:00 a.m.
Register online. You will need your conservation ID. If you do not know your conservation ID, contact the CE/FS Program at 860-424-3007.